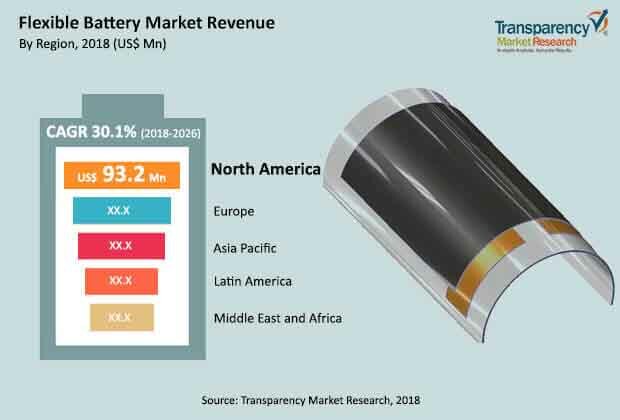 Transparency Market Research (TMR) (www.transparencymarketresearch.com) has published a new report titled, ‘Flexible Batteries Market - Global Industry Analysis, Size, Share, Growth, Trends, and Forecast, 2018–2026’. According to a new report, the global flexible batteries market was valued at US$ 250.0 Mn in 2017 and is projected to expand at a CAGR of 30.0% from 2018 to 2026. The global market for flexible batteries market is primarily driven by the rise in demand for flexible batteries from electronic manufacturers and assemblers. The flexible batteries market in Asia Pacific is anticipated to expand at a rapid pace during the forecast period owing to the increase in presence of electronic manufacturers and assemblers. Rise in production capacities of manufacturing companies and assembly plants in the region is likely to drive the demand for flexible batteries during the forecast period.